I attended the Productivity Power Panel 2016 Year In Review webinar last. Yes, that is indeed a mouthful. But it was one of the best spent times. It was an interesting hour-and-a-half with some of the productivity evangelists like Steve Dotto (Canadian technology media personality now popular on YouTube @DottoTech), Mike Vardy (writer, speaker, and Founder and President of Productivityist) and Brooks Duncan (Founder of DocumentSnap and my soon-to-be mentor to a Paperless world). They shared their inputs on productivity tools and it was great to hear the opinions of some 500 other productivity enthusiasts who had joined the webinar today. And guess what – that is my productivity stack right there! 🙂 Since the recent past, time has become a very limited commodity for me. So I have been seeking inspiration from productivity gurus out there to do as much as I can with the time I have. There were lots of discussions around other productivity tools and technologies as well… like Blinkist, noise-cancelling headphones, Asana, Email and Task management and so on. One of the areas I struggled a lot earlier this year was my Personal Inbox. When I lost a major order for over £3,500, 🙁 I knew I had to do something about the chaos in my mailbox. I took action and there was no looking back. Now I don’t “lose” my personal/business emails and they get the same priority (if not more) like my work emails. And this with just checking them twice a day. So I thought, why not share my tips and techniques with the World Wide Web. A mini-series of articles on Inbox Zero will be out soon. Let me know if this will be of interest to you or show your support on Social Media or comments below. 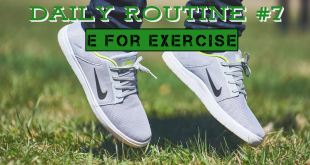 I am building a daily routine and this week I am sharing tidbits about it on my website. In this final article, I share about exercise.